Live Chat Software allows interaction between customer support executives and website visitors or customers in real time. Professional Live help website application is superior customer support service for online communication with your website visitor/customer in anytime and anywhere around the world. Live chat software is widely used for small and medium scale businesses including Real estate, Education, Travel agency, Auto sales, Insurance, online sales etc. You can easily provide superior customer support and technical guidelines to your customers in affordable way with web chat communicator utility. Establish interaction between technical support executives and online customers or website’s visitors in real time. Facilitate to manage multiple visitors simultaneously. Customer support agents can view visitor’s information including IP address, Visitor name, Department name, Arrival time and date, Screen resolution, Company name etc. Operator can also interact with each other during online chatting with visitor. Provide "chat history" tab that shows all your chatting history details including the chat time and date. Provide facility of sending chat details to visitors on their specified email address for future reference. 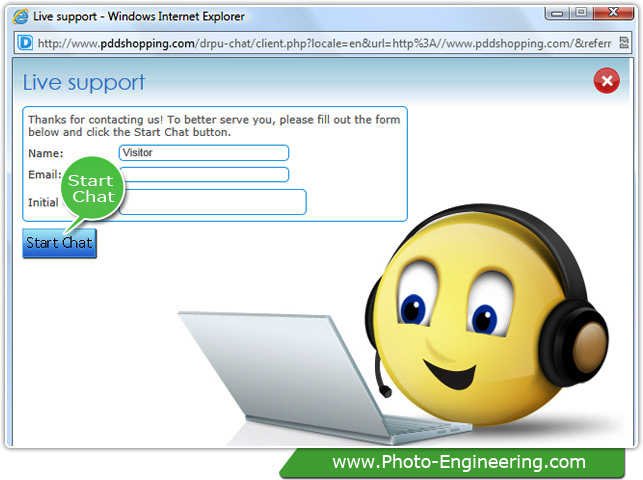 Operator can block IP address of mischief visitor/customer from entering chat session. Helps improving customer’s relationship by providing online support with the reduced response time.